Terry Mikels | Mikels & Jones Properties, Inc.
Terry L. Mikels, a native of High Point, received his B.A. from North Carolina State University in 1979. His sales career began with the Burroughs Corporation in Raleigh. 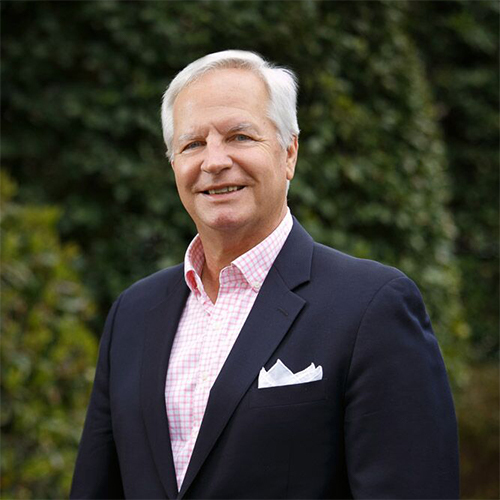 In 1984, Terry’s interest in commercial real estate led him to begin his career with Synco Properties, a regional real estate syndicator headquartered in Charlotte. He was introduced to the leasing market with Synco and after two years he established his own tenant representation firm, Mikels Properties. In 1989, Terry welcomed Reid Jones as a partner to form Mikels & Jones Properties, and their success as a team has lead to a more diverse offering of services to their clients. As a partner in Mikels & Jones Properties, Terry continues to work the leasing, brokerage, and income property markets and has expanded into development and redevelopment of buildings especially in the North Hills area. In 2004 Terry was recognized by his peers as the winner of the Presidents Circle Award, an annual award given by the Triangle Commercial Area Realtors to the member who most consistently gives back to the community. Terry and his family have been involved with many civic organizations in Raleigh, including Hilltop Home, Fellowship of Christian Athletes, Young Life, Mira Foundation (provider of service dogs for blind children). Terry has served on many local non-profit and corporate boards. Terry enjoys hunting, fishing, and golf. Terry and his wife, Juana, are very active in the ministries of Capital Community Church where he currently serves as an Elder. They have four children, Blair, John Charles, Alex and Mary Elizabeth. They have lived in Raleigh since 1975.